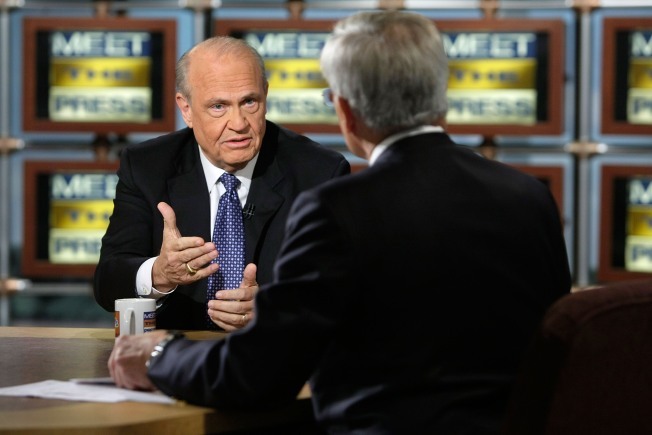 Former Sen. Fred Dalton Thompson (R-TN) (L) is the latest Republican to declare he wants President Obama to fail. When last we saw Fred Thompson, it wasn't as either TV District Attorney Arthur Branch on "Law and Order" or as a failed Republican presidential candidate in the 2008 presidential primary. Actually it was in a small role in the now-canceled ABC show "Life on Mars," where a 2008 cop travels back in time to 1973 (AKA "Mars," because it's like "waking up on another planet'). Thompson played the NYPD chief of detectives on one episode. Apparently, that was the perfect metaphor for his latest appearance this week when he decided to follow other Republicans and conservatives in acting like Martians who are seeking the failure of the president of the United States. Rush Limbaugh started this back in January and now it has become a matter of course for members of the media to ask Republicans if they want the president to "fail." Given that Thompson has had hundreds of acting roles and is more familiar with the media than just about any politician of either party, one would expect that he wouldn't fall into this trap. "I want his policies, that I believe take us in the wrong direction, to fail," Thompson said on CNN. Pressing him for further detail, CNN anchor John Roberts asked, "Well, that's the same, saying you want him to fail, isn't it?" "Well, you know, we're quibbling over words... you can put it any way that you want to," said Thompson. Thompson was responding to comments made by Louisiana Gov. Bobby Jindal (a possible 2012 candidate) at a Republican fundraiser Tuesday night where he said it was acceptable for Republicans to want Obama to fail when they disagree with his policies. As reported by CNN, Jindal said the premise of the question --"Do you want the president to fail?" --had become a "gotcha" game for Democrats. "Make no mistake: Anything other than an immediate and compliant, 'Why no sir, I don't want the president to fail,' is treated as some sort of act of treason, civil disobedience or political obstructionism," Jindal said, adding, "This is political correctness run amok." This is ultimately a losing strategy -- to the extent that there is anything strategic about it. Presidents have unique roles in the public consciousness. Technically, they are just like any other politician -- and the leader of their party at that. But in reality they are also seen as ceremonial heads of state and "above" politics. Saying you want the president to fail -- for the average person in the middle -- often sounds like you want the country to fail. Parsing distinctions between hoping policies fail, but not the president to fail is tortuous explaining. And there's a rule in politics: If you're explaining, you're losing. It shouldn't be to hard for Republicans who find themselves facing this question to come up with the right answer. Q. Do you want President Obama to fail? A. No, I don't want the president to fail. We all want what's best for the country. That's why I hope he adopts the Republican alternative budget (or proposal/policy/approach). That's why I hope he restrains excessive spending so we don't face bankruptcy or leave our children an unsustainable debt. Just like President Clinton succeeded as he worked with Republicans on ideas like welfare reform, balancing the budget and lowering trade barriers, I hope President Obama is similarly successful -- and that the country will be as well. And that's how Mars can meet Venus on Earth. And everybody can live happily ever after. New York writer Robert A. George blogs at Ragged Thots.